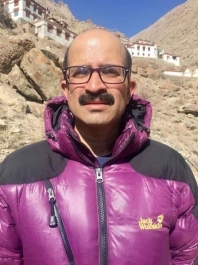 Vilas Kadival, an entrepreneur and tour enthusiast with a passion for the Himalayas, started his company, Himalayan Fantasy, in Bangalore four years ago. Earlier, Vilas was involved with IT organizations in Bangalore for 20 years. It's been a quest for knowing human existence and spirituality which drew him towards Buddha teachings initially through discourses of the Dalai Lama from 1999 onwards with comparative religions of Hinduism and Buddhism. And then going deeper into philosophy, meditation practices and the quest for experiencing truth made him go deeper into the Buddha teachings and philosophy from 2013 onwards, with Vipasanna and making the best of life to have a life as explained in the Suttas. Vilas believes that Buddha teachings are pure science and anyone can experiment and experience the truth in himself/herself. 1. There is nothing in this world which can be maintained for a long time, and with time will diminish and die out. 2. Whatever we are attached to in turn will bring in hardship and suffering when we lose them. Examples: Love, affection, food, habits, relationship, etc. 3. Every person is helpless due to the law of nature and nothing can be done to change it even though we find ways and means to make ourselves comfortable with the situation. Q. Despite born into a Hindu family, what attracts you to Buddhism? First of all, the ideology of Hinduism can be represented in six philosophical schools which have similarity to the Buddha’s teachings. The only difference is that the current Hinduism believes in God as the Creator. Most of the teachings of the Buddha can be found in the Upanishad and the Yoga Sutra of Patanjali, which are two of the six philosophical schools. Having said that, the Buddha’s teachings guarantee liberation from relentless birth, decay and death and that has been the motivation for me to embrace the Buddha teachings within myself and put a sustained effort in following the Noble Eightfold Path. In conclusion, the guaranteed path of liberation from birth, decay, and death made me realize the urgent need to fully follow the Buddha teachings. Q. How a person is lucky to be born into a Buddhist family? There are many other causes other than the above-mentioned ones, and it need not be that they are fully grasped or perfected to be born into a Buddhist family. In the lifetime of a being, if any one of these is followed to the best extent, he/she is likely to be born into a Buddhist household. Thus, being born as a human being is one of the lucky signs and if a person is born into a Buddhist family, it is luckier since he/she can now learn how to liberate oneself from the clutches of delusion. Being born into a Buddhist family, the individual is given an opportunity to study the teachings of the Buddha and experience it profoundly in his/her life which is not otherwise possible. Q. What is the meaning of being a Buddhist? A Buddhist can be defined in a single sentence:“A person who can know and experience becoming, arising and passing away in everything” and is able to stay alert, calm and feels compassionate with all beings since he/she can see that everyone is going through the same phase. This is unique to the Buddha dharma and not found in any other traditions or cultures. Q. Like other parts of the world, Ladakh is also witnessing suicide cases among youngsters. So, how can we make them understand that life is precious, according to Buddhism? A single answer which comes to my mind after experiencing arising and passing away of everything is that the more we cling to those experiences which are thought to be true, the more suffering a person will undergo. This feeling of unfulfilled aspirations causes depression in a person who feels let down. As depressed thoughts take over that person, he/she starts living and experiencing them, which ultimately drives the person to end his life. A person, who undergoes depression requires motivation which the Buddha dharma provides plenty. Meaning to say, just a word like “anicca” (everything cannot be prolonged in anyone life for a long time) will make the person realise that nothing exists as perfect in anything and this makes the person accept the situation and then he/she can find that the depressed thoughts are fading away and is filled with positivity, thus driving him/her away from suicide. As regards the Ladakh region, with the advent of modernization, and materialistic values being incorporated, makes some persons feel depressed. The good news is that for a person born into a Buddhist family it would be easier to tame his mind through meditation. Q. How important is it to implement the teachings of the Buddha in an ordinary life? 5. Not to be intoxicated with pride, drugs or liquor which makes one senseless. Following these five precepts, one will liberate oneself from endless sufferings and one can feel it the moment he/she starts following it. Q. What are the benefits of being a Buddhist? One of the benefits of being a Buddhist is that the person is automatically on the path of liberation whether he knows it or not. If he/she were to become aware of it, then he/she would enjoy the fruit of freedom which would bring in him/her, by following the Noble Eightfold Path. Buddhists have a unique environment which is filled with contentment, kindness, and patience which can be easily found out by comparing with cultures and traditions followed worldwide. There is so much unrest, all in the name of religion, all over the world. A Buddhist can refer to the teachings of the Buddha to liberate himself from all kinds of violence and destructive acts. An example: China invaded Tibet and all the people moved to various countries, but still their patience, loving-kindness, and compassion in these tough times is a testimony to this culture following the Buddha teachings. Q. What is the difference between Buddhism and other religions? Buddhism is all about understanding oneself and believing that no one could be a refuge except for whatever actions one is performing as either good or bad and will have to bear the consequences. In other religions, there is the concept of God who would be watching everyone doing or undoing and will help in getting a better birth if they were to please Him in whatever name and form it has been defined. Q. What is the basic teaching of the Buddha? The basic teaching of the Buddha is to understand oneself, and that everyone undergoes the same journey of life and it seems different when viewed separately; but in essence, all sentient beings in 31 realms of existence undergo ‘anicca’, ‘dukkha’, and ‘anatta’ which can be understood by following the Noble Eight Fold path, the Five Precepts, and the Four Noble Truths. Q. Buddhism is all about respect and equality of all religions. Why do you think many of us do not understand? How important do you think it is for people to realize this? Buddhism has never been a religion but understanding the nature of things in everything we do. Due to that reason, compassion, love, and kindness, appreciative joy and equanimity to situations become the corner-stone of the Buddha’s teachings. However, when viewed from a materialistic angle, we miss the basic aspect and get submerged in ritualistic aspects, and hence suffer in not understanding the basic Buddha teachings. It is very important for people to follow at least the Five Percepts which are simple and lead to a moralistic living. Q. In Buddhism, it is said that what you think you create, what you feel you attract, and what you imagine you become. Share your views. Our thoughts create waves of the pattern which becomes like electromagnetic induction with different frequencies and that gets shown in the material world as an object. Thus every imagination ultimately becomes reality, and bodily and verbal actions put the actual object into the picture. Example: If a house is to be constructed, a design comes as an idea and then transformed into a drawing on a paper, and later, with solid materials, you get a form. Q: What is the difference between rebirth and reincarnation in Buddhism? In the Buddha words, there is no reincarnation but rebirth consciousness, just like electricity in every bulb. When one bulb dies, another bulb is replaced to continue from where it left. Reincarnation means the same being comes back in another body and starts to continue from where he/she left it. Q. A person may have earned wealth and many things in life. But we have seen that when he dies, he leaves everything behind. Why people are still greedy about things when it is preached that the materialistic world is just the attraction to the eyes. People become greedy or show that tendency due to a habit pattern they have created in the past and want to enjoy that all the time from life to life. Greed is not only about what we see with your eyes, but also through all the five senses and ideas that seed up in our mind. The Buddha never rejected that there should not be any material things to be enjoyed but need to be enjoyed with a view that ultimately with the realization that you should not have an attachment. Q. Buddhism a religion or philosophy? Comment. A better way to explain it use the word Buddhist in Pali as Bahuddaya– Bhava (to form/become) udaya – (arising) vyaya – (disappearance). In simple words, it is the science of understanding how a being comes into existence, grows and diminishes which happens due to greed, hatred, and delusion in varying quantities which create the being based upon what that being wanted to experience. Thus, one can say Buddhism is not a religion but a scientific philosophy. Q. There are many sects of Buddhism. How are they different from each other? There are many sects of Buddhism due to the personal interpretation of each of the sect heads and nothing to do with the original dhamma teachings of the Buddha. They all follow the same path which was explained by the Buddha but as different schools of thought. Consider it as the same liquid in different containers, as an example. Q. Can you explain how difficult it is to follow the Five Precepts for a layman? The Five Precepts are difficult to follow when the person is driven by greed, hatred, and delusion and all that one has to aspire for is available as material comforts over spiritual healing. If one were to understand in the right perspective, then following the Five Precepts would not be difficult.